Brock was an accident, but a fortunate one! 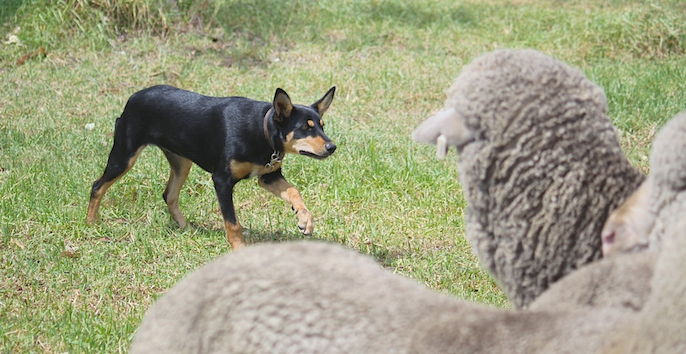 Brandy had been mated to Cagella Rock but whelped a week late and as the pup grew up he became a mirror image of Akubra. A DNA test confirmed my suspicions. I had tried a double cross of Spice previously and less successfully. At this stage, two years later, Brock is growing into probably the best young dog I’v bred. He has always been calm and sensible on stock, has a great work ethic, is a lovely type and is very good natured. Arthur Crumblin took him to start for a few weeks and found him hard to fault. Brock did very little work as a youngster. I was reluctant to let him go away to work until I had some pups by him, having been caught out before…especially over summer when snakes are out. He is growing in confidence and recently impressed when he worked cattle for the first time. 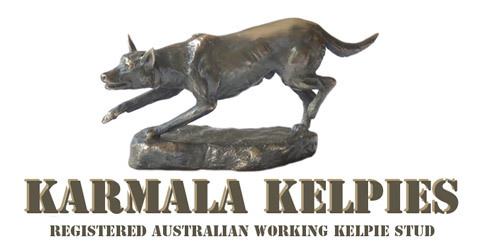 He was mated to Karmala Chanel(Whitehead’s TrackerxKarmala Lily) and she had a good litter of 10. Brock was mated to Lily before going to John Clothier in July 2015 for experience on cattle. 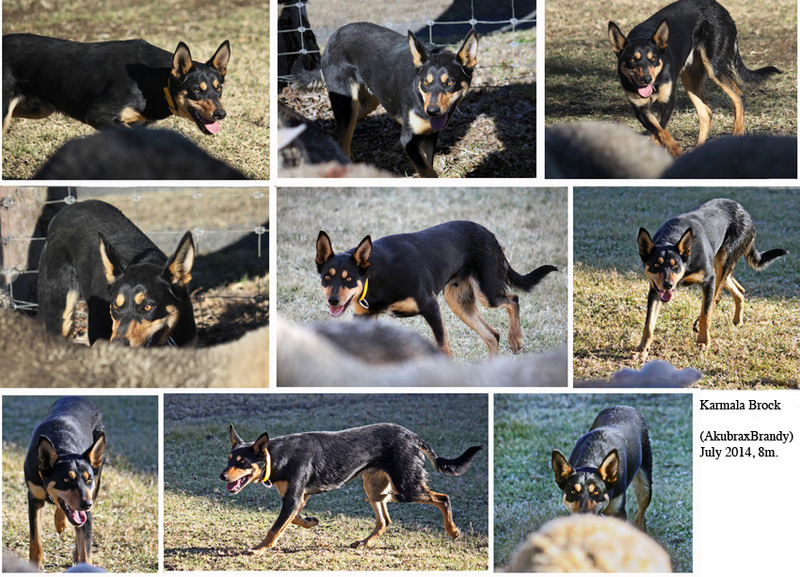 I took a daughter of Brock, Benalee Mocha(Brock x Karmala Lyndy) to Jeff Ritchie for some training in Jan. ’16, and Jeff rated her and Karmala Wings as the best kelpies he’d seen in 15 years! Karmala Brock(K.Akubra x K.Brandy) has his sire’s looks and his g’dam’s lovely calm work. He has a hom.% of 12.5 to Spice. Here at 5mths.